Toothbrushing as an oral hygiene measure has become an integral part of daily routine and regarded as safe for children. Toothbrush has been designed in such a way that it should not harm the soft tissues. Oropharyngeal injuries in children due to toothbrush while brushing the teeth can damage the vital tissues and vessels around the oropharynx and can end up with severe complications. Here, we report a case of a 3-year-old female child who had a severe oropharyngeal trauma while brushing was performed against to the child's wish. The manual toothbrush plays an indispensable role in one's oral hygiene practice. It leaves behind a feeling of freshness and contributes to the development of a healthy smile. Toothbrushes are one of the most common devices used every day, and the risk of morbidity is very low. However, owing to the frequency of its use, there could be some adverse events that can sometimes become life-threatening, especially in children. Children tend to get playful during brushing and might result in unforeseen injuries. One of the reasons for such injuries may be due to the use of improper brushing techniques. The major reason for improper brushing can be attributed to low level of manual dexterity in children or due to the rigorous movement of the head by the child when toothbrushing is imposed forcefully by the parents. Blunt injuries to oropharynx often gets neglected; however, sharp and penetrating injuries are harmful, and there have been several documentations on injuries incurred by toothbrushes in children along with other objects such as pens, pencils, and chopsticks. This case report presents an instance where a 3-year-old female reported to the Paediatric dental operatory at JSS Dental College and Hospital, Mysore, with a penetrating type of soft tissue injury to the region of the anterior faucial pillar. A 3-year-old female was reported to the OPD of JSS Hospital with a wound inside the oral cavity. Parents gave a history of injury while brushing the child's mouth forcefully. Tooth brush got impacted in the surrounding soft tissues and was pulled out immediately by the mother. The parents reported to the pediatric OPD along with the intact toothbrush 4 h after the injury. After primary evaluation and management, the child was referred to the Department of Pedodontics, JSS Dental College and Hospital for treatment almost 9 h post-trauma. On examination, there was no active bleeding, and the child showed no obvious distress. She was cooperative, and the vital signs were normal. Intraoral examination showed that there was a penetrating type of injury of 3 cm × 2 cm in dimension on the anterior facial pillar [Figure 1] and surrounded by erythema. The depth of the wound was filled with slough. No abnormalities or injury were detected extraorally. The patient had severe pain and tenderness at the site of injury and had excessive salivation and restriction to mouth opening. The wound was copiously irrigated with saline. After irrigation, base of the wound appeared slightly granulomatous, and since it was covered with slough, it was decided not to suture the wound and allow it to heal. A course of antibiotics and analgesics were prescribed. The patient was recalled for review after 3 days to observe the healing process. The wound showed signs of uneventful healing, and the pain and tenderness had reduced by the 3 rd day. One week post-trauma, the wound had healed well, and there were no further complaints [Figure 2]. Toothbrushing is considered to be a meaningful and effective oral hygiene measure. Injuries are more commonly noted in children because of the poor manual dexterity or resistance by children for toothbrushing or vigorous head and neck movement when oral hygiene being enforced by parents. In spite of being made of a pliable material and safety in terms of its design (smooth surface and rounded corners), there have been reports of rather rare traumatic injuries to the oral mucosa as well as the oropharyngeal region, even leading to the impaction of the toothbrush. This poses a serious threat of morbidity, especially in children. The sites of injury reported are mainly the gingivobuccal sulcus, buccal fat of pad, retromolar trigone soft palate, anterior facial pillar, and pharynx. Oral pharyngeal injuries caused by toothbrush have been classified by Kumar et al. as follows: blunt injury; when there is no mucosal break or perforation, penetrating injury; where there is deep laceration/deep perforation of the soft tissues, but the toothbrush has been already removed from the wound, impalement injuries; the toothbrush is impacted within the tissues because of the fish hooking of bristles, embedded injuries; the head of the toothbrush breaks and is retained deep within the tissues, and blunt injuries of the oropharyngeal region are generally ignored because of lack of serious complication. However, even such blunt injuries have been reported to cause damage to the internal carotid artery and thrombosis leading to cerebral infarction and neurological complications. Such patients may present with neurological symptoms such as hemiplegia or hemiparesis or coma. All other injuries to oropharynx will be accompanied by laceration in the oropharyngeal area. In such cases, if the suspected object which has caused the injury is not available for clinical examination, a computed tomography (CT) scan with three-dimensional reconstruction should be a mandatory investigation so that it can be confirmed that any embedded part of that suspected object is not left inside the soft tissue. These kinds of injuries in addition to the damage of carotid artery, run a high risk of air entering into soft tissue spaces in the neck region, which might lead to emphysema within the neck, mediastinal emphysema, or even pneumoencephalocoele. Management of such cases would require prolonged intubation and mechanical ventilation until the risk of infection reduces. In suspected cases where CT scan shows the toothbrush in proximity to the carotid vessels, simple removal or retraction of toothbrush may pose the danger of severe bleeding. In such cases, magnetic resonance angiography or angiography should be considered to rule out the penetration of carotid vessels. Management of injuries to orofacial region depends on the kind of injury noticed during the examination. If the injury is of a blunt type without any damage to the underlying structures, only observation for - Airway obstructions, profuse or continuous bleeding, any neurological symptoms and signs for acute infections would be advised. If the wound is of moderate laceration type, without any part of the object or full object being impacted, Such wounds can be left open. It is advisable to leave the wound open, if the wound is infected and has necrotic tissues or slough at the base of the wound. Closing such wounds with suture will result in entrapment of microbial load in the tissue spaces, leading to retro- or para-pharyngeal abscess  or life-threatening mediastinitis. Since oral cavity is a harbor of diverse species of both aerobic and anaerobic bacteria, antibiotic coverage becomes a very important part in cases of penetrating injuries in oral cavity as it harbors diverse species of both aerobic and anaerobic bacteria. , In the present case, the child suffered from penetrating type of injury; the object was already removed from the wound. Since the wound was filled with slough, gentle irrigation was done with saline, and it was decided to leave the wound open and observe for its uneventful healing. With this case report, it should be emphasized to parents that they should be very careful and cautious while brushing their child's teeth and they should always supervise it. The child should never be allowed to do other physical activities such as playing or running with sharp or blunt objects inside the mouth. In rare circumstances when a child presents with a toothbrush injury resulting in an oropharyngeal trauma, it is imperative to take a thorough case history and to check meticulously for impaction of toothbrush fragments or other foreign bodies. Early diagnosis with suitable investigations and thorough follow-up would help avoid complications arising from retained foreign bodies as such injuries in children could even cause a threat to life. Oliveira SC, Slot DE, van der Weijden F. Is it safe to use a toothbrush? Acta Odontol Scand 2014;72:561-9. Ebenezer J, Adhikari DD, Mathew GC, Chacko RK. An unusual injury from a toothbrush: A case report. J Indian Soc Pedod Prev Dent 2007;25:200-2. Lalitha RM, Ranganath K, Prasad K, Agrawal K, Perumal M. Potential danger of toothbrushes for children. J Investig Clin Dent 2011;2:148-50. Sagar S, Kumar N, Singhal M, Kumar S, Kumar A. A rare case of life-threatening penetrating oropharyngeal trauma caused by toothbrush in a child. J Indian Soc Pedod Prev Dent 2010;28:134-6. Kumar S, Gupta R, Arora R, Saxena S. Severe oropharyngeal trauma caused by toothbrush - case report and review of 13 cases. Br Dent J 2008;205:443-7. Sidhu MK, Shaw DW, Roberts TS. Stroke after blunt oropharyngeal trauma. J Trauma 1997;42:541. Kosaki H, Nakamura N, Toriyama Y. Penetrating injuries to the oropharynx. J Laryngol Otol 1992;106:813-6. Sasaki T, Toriumi S, Asakage T, Kaga K, Yamaguchi D, Yahagi N. The toothbrush: A rare but potentially life-threatening cause of penetrating oropharyngeal trauma in children. Pediatrics 2006;118:e1284-6. López-Peláez MF, Roldán J, Mateo S. Cervical emphysema, pneumomediastinum, and pneumothorax following self-induced oral injury: Report of four cases and review of the literature. Chest 2001;120:306-9. 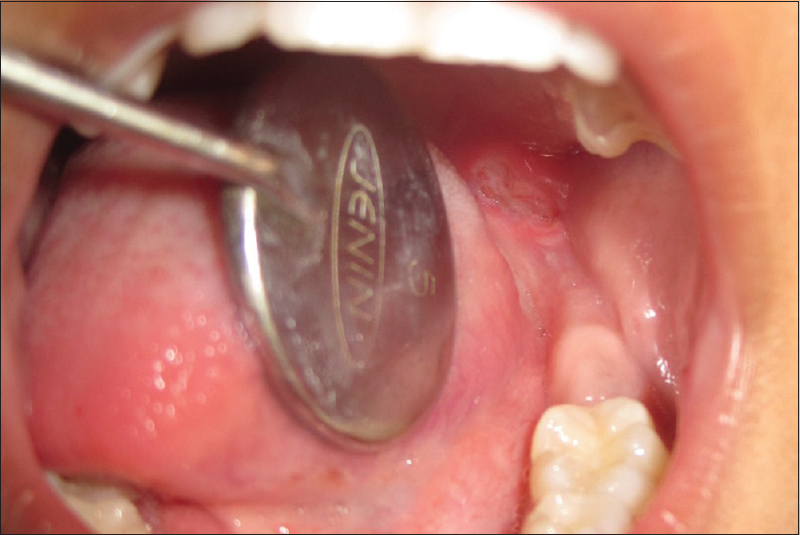 Altieri M, Brasch L, Getson P. Antibiotic prophylaxis in intraoral wounds. Am J Emerg Med 1986;4:507-10.